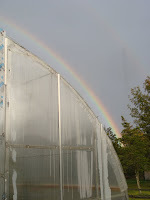 A heavy shower last night produced a once-in-a-lifetime rainbow that perfectly echoed the arch of the greenhouse, as seen from the doorway of the chicken's barn. I couldn't fit the whole thing into one shot, but it was a pleasing sight. Today I discovered that we have at least two laying hens. 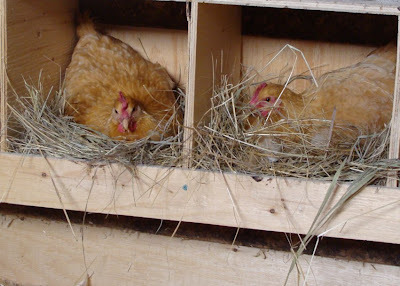 They were sitting in their respective nest boxes when I visited the barn to feed the chickens some leftover spaghetti squash. There were two eggs when I went back just now. This is the first day we've had more than one egg, bringing the average since they started laying up to one a day. Is it a bit sad of me to have set up a spreadsheet with this information in it? Get to work, you lot! I keep my plant book collection in a spreadsheet but the Digger has a spreadsheet for every occasion (or so it seems to me). Did they see the rainbow? Perhaps that will make a difference. Gorgeous looking hens! 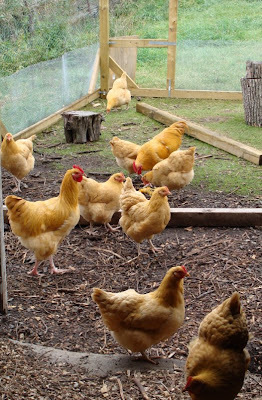 I am sure they will all start laying soon and you will be inundated with eggs.